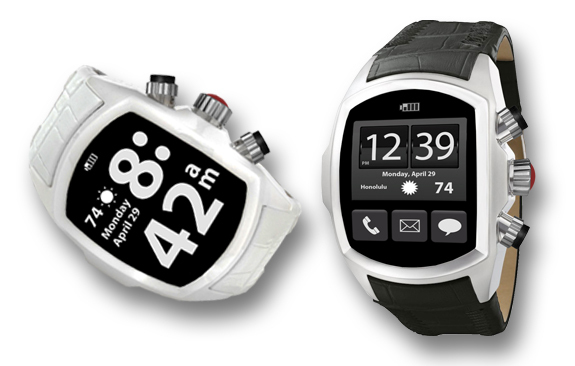 Heres’ an interesting new addition to the range of smart watches that may go on sale soon. Smartfitty is an inexpensive-ish (it should retails for around £80) watch that its maker hope will be available in September 2013. What set it apart is that it has two key features. Firstly, unlike some rival watches, it has a responsive touch screen. This really does make watch easier to control! Secondly it has been optimised to appeal to fitness freaks who want to track everything from steps taken though to hours slept. So the basics then… It is a standard smart watch which can be teamed up with the iPhone or Android handsets via Bluetooth and deliver the usual stuff – notifications for calls, email, text messages, iMessges, calendar reminders, Facebook Twitter etc. You can also customise the watch’s fascia too. But it pairs that up with a whole raft of fitness features including sleep cycle tracking, running speed, calories burned on your run etc And there are apparently a load more to come too. Also interesting is an integrated security feature, so if you are concerned about the environment you are running in the Smartfitty has an emergency option which when activated sends an alert and your GPS location to your SOS contact list. The company behind the watch are also encouraging tech heads to make apps for the device so if it takes off then all manner of extra features could be on board soon. It comes in two versions- one for blokes that is brushed stainless steel casing with black leather strap and one for women that has White ceramic casing with white leather strap. If you are ultra sporty you can also opt for a rubber strap. The watch is currently on Indiegogo and the company are looking for funds to deliver the project. Here’s hoping that it makes the cut as it looks like a stylish and smart watch. More on smart watches and the Apple iWatch here.